In 2009, the first molecular data were generated that proved past observations of the occurrence of hybridisation between human and cattle schistosomes, with large numbers of children being infected with these parasites. This raised concern due to the potential zoonotic schistosomiasis transmission risk in Africa. The potential impact these hybrids can have then became evident following the outbreak of urogenital schistosomiasis on the idyllic Mediterranean island of Corsica, France in 2014. Amazingly the Corsican hybrid schistosomes were able to be captured and bred in the laboratory (University of Perpignan), providing unique material to enable the 1st genome wide investigations into these hybrid forms. 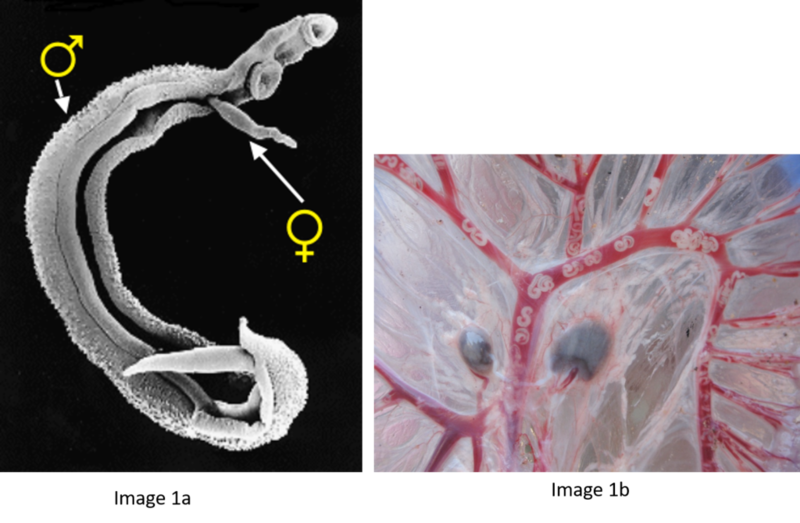 1a: Scanning Electron Image of a Schistosome worm pair (species Schistosoma nasale) highlighting the sexual dimorphism between the adult male and female worms. It is this sexual stage that enables interplay between different species. 1b: Dissection of a goat in Senegal. The adult worms can be clearly seen in the blood vessels around the intestine. Image David Rollinson (NHM). After malaria, schistosomiasis is the most common parasitic disease and the most deadly Neglected Tropical Disease (NTD) burdening and inflicting unnecessary suffering on many poor rural communities (>200 million infected, >700 million at risk) in 74 tropical and sub-tropical developing countries. It is a water-borne disease associated with poverty, poor sanitation and a lack of safe water supplies. Schistosomiasis is also a major disease of animals, affecting large numbers of domestic livestock worldwide, but the veterinary and economic impact is largely unknown, with animals rarely being treated. Schistosomiasis is a chronic and debilitating disease caused by infection with trematodes (called schistosomes or Schistosoma species) that have a complex two-host lifecycle involving an asexual stage in specific fresh water snails and a sexual stage living in the blood vessels of their preferred mammalian hosts. Schistosomes are diverse parasites with many described species. They are transmitted in different parts of the world, their distribution being largely dependent on the presence of their specific snail hosts. In Asia, schistosomiasis is known to be zoonotic, which considerably hampers control efforts and emphasises the need for a One Health approach, and now this scenario could be evolving in Africa facilitated by inter-species hybridisation. Schistosomes are unusual in the parasite world, in the fact that they are dioecious (have separate sexes). 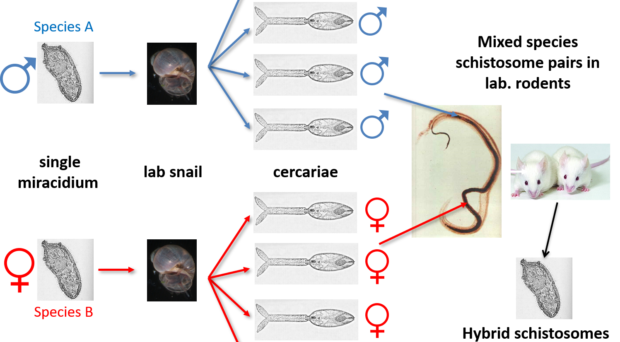 The sexual stage of adult schistosome worms enables interplay between males and females. Originally schistosomes were thought to have a very romantic lifestyle being monogamous and staying paired for life. Male schistosomes are very dominant in this process choosing and holding their more slender females within their sophisticated gynaecophoric canal. However, we now know that males are promiscuous, changing partners, taking more than one female and stealing females from other males, with different species showing more competition over others. Back in the 1970s to early 2000’s many laboratory mating experiments were successfully performed between male and female schistosomes of different species. These experiments were done to investigate the outcome of mixed species interactions, to enhance our understanding of the biology of these fascinating parasites and to understand the dynamics of these species in their natural environment. Several species were able to pair (reviewed here) but the successful production of viable offspring depended on the species involved. It was clear that the production of viable offspring (hybrids) only occurred if the species involved were closely related in terms of their evolutionary history. Certain species combinations were highly successful resulting in multiple generations of successful hybrids, showing that given the opportunity hybridisation between schistosomes will readily occur. Where are the adult worms of each species encountering each other ? Has this hybridisation always been happening or is it a new phenomenon ? Do we have true zoonotic transmission ? What is the impact on human or animal health ? Humans and animals sharing the same schistosomiasis transmission site in Senegal (Photo Tine Huyse, African Museum, Belgium) and fieldwork conducted in 2007 looking for schistosomes in slaughtered livestock. Further attention was brought to the hybridisation between S. haematobium and S. bovis when, in 2014, tourists unexpectedly caught urogenital schistosomiasis whilst swimming in the picturesque natural pools on the island of Corsica, France. Transmission was enabled by the presence of the snail Bulinus truncatus, a snail host for African schistosomiasis, being endemic in the Mediterranean and the parasites were introduced by the regular migration of people between Corsica and West Africa. Natural swimming pools in Corsica and collection of B. truncatus snails from the Cavu River (Photos Jerome Boissier, University of Perpignan). The molecular analysis of schistosome eggs isolated from infected tourists revealed the schistosomes were a mixture of S. haematobium and S. haematobium–S. bovis hybrids. Fortunately, these hybrid schistosomes were isolated and were successfully bred in the laboratory providing invaluable material to explore this hybrid system. Julien Kincaid-Smith, a former PhD student at the University of Perpignan, centred his research around this Corsican hybrid schistosome. Julien has performed the first full genome scale analysis and provided morphological and phenotypic characteristics of these hybrids. His recent paper highlights the predominance of S. haematobium in this hybridisation process and shows that these hybrids are not 1st generation hybrids. The data revealed a complexed admixture of the parental genomes (76.9% S. haematobium and 23.1% S. bovis) probably as a result of many hybridisation and backcrossing events. Percentage admixing of the Corsica hybrid genome highlighting the predominance of the S. haematobium-type DNA. This novel genome analysis provides an important stepping stone on which to further investigate natural hybrid populations in Africa with an aim to answer some of the long standing and important questions. If introgression levels of the hybrid populations are homogenous then we can conclude that hybridisation is rare and maybe a historical event. 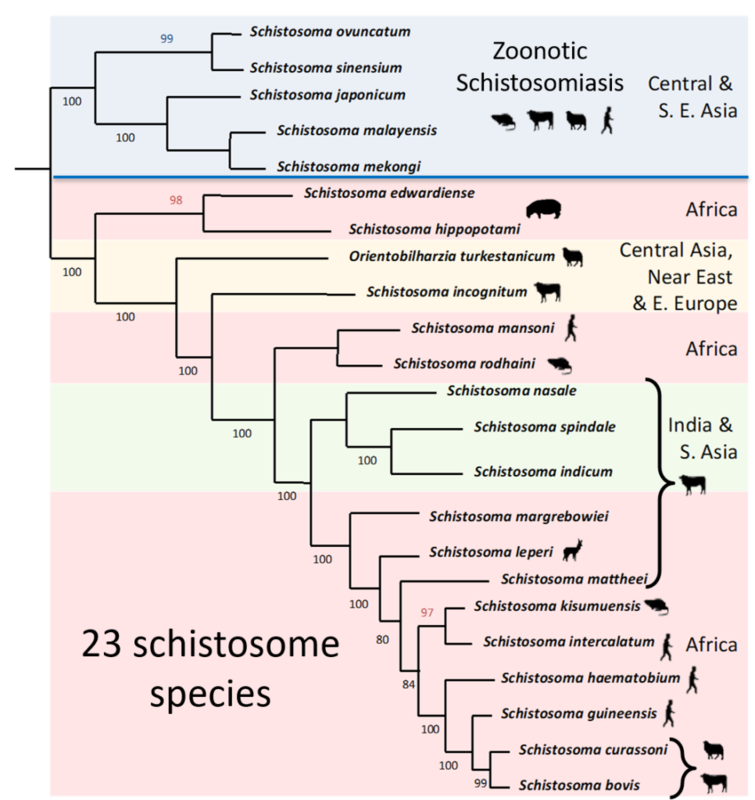 However, if introgression levels vary considerably and hybrids form distinct populations then we could have evidence for ongoing and dynamic schistosome introgression, posing a real risk of zoonotic schistosomiasis in Africa.